The Ballykeel (An Baile Caol) Dolmen stands beside a side road north of Mullaghbane and south of the B30 on a fenced patch of land. As for many historical sites, there are no signposts on the last few metres, but it can be easily seen from the road. The dolmen - locally also named Hag's Chair - was the entrance portal to a cairn (about 3500 B. C.) of which nothing else remains. Its former extensions can be discerned from a few stones lying around. 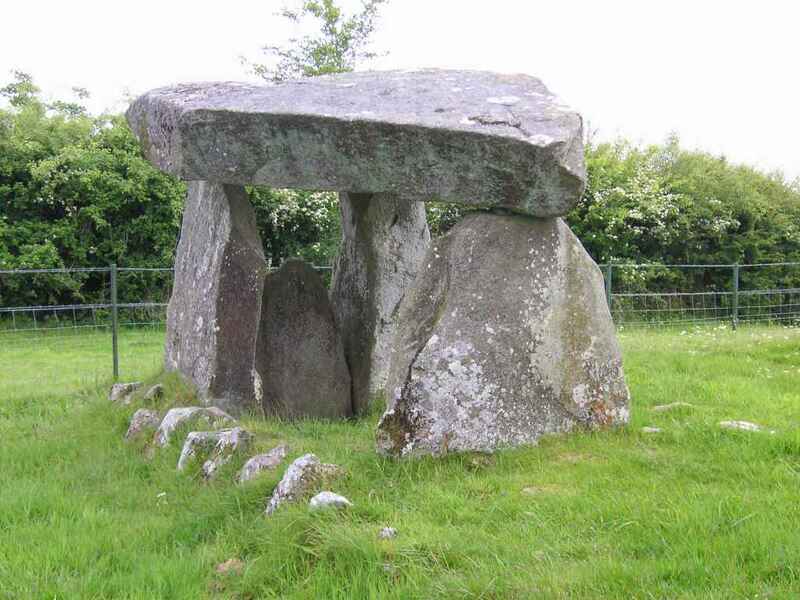 The capstone rests on three standing stones, touching them on an area not more than hand-palm sized. The description panel tells us that the capstone fell down when the back stone broke apart. After it had been repaired, the capstone could be lifted into position again. Between the entrance stones (2 metres high) the closing stone was set up.